Introducción. La tungiasis, o infestación cutánea por la pulga Tunga penetrans, ocurre en comunidades muy pobres. Objetivo. Presentar la entidad en indígenas del Vaupés. Métodos. En primer lugar, se revisó el tema. Luego, se describió el área y la vivienda de los pacientes afectados; se detectaron los animales infestados con la zoonosis. Se iIustró el aspecto clínico y sus complicaciones y, posteriormente, se trataron los pacientes con creolina. Se logró hacer modificaciones en el piso de las malocas de dos comunidades, con humedad y arcilla, y se impartió educación a la comunidad sobre esta parasitosis. Resultados. El 95% de los 33.000 habitantes del Vaupés son indígenas. Algunos moran en viviendas de piso arenoso, seco, con detritos alimenticios y perros con tungiasis. Entre 1996 y 2007 confirmamos 942 casos del parasitismo. De los indígenas estudiados, 3 a 8 de cada 1.000 y 62% de los perros, presentaban tungiasis. Los pies se vieron afectados en 98% de los pacientes. Se presentaron casos graves con más de 20 lesiones, en niños y ancianos. Como complicaciones, se presentaron: infección secundaria, dolor, anoniquia, deformación y amputación de los dedos de los pies e imposibilidad para la marcha. Hubo sepsis mortal en tres pacientes. No se presentaron casos de tétanos. Los baños con creolina y la extracción del parásito fueron curativos, en hombres y animales. La modificación de los pisos redujo a cero la enfermedad en una comunidad. Conclusiones. La enfermedad es intradomiciliaria. El piso de la vivienda y la convivencia con perros infestados son ideales para adquirirla. La creolina, la humectación del piso y el cubrirlo con arcilla controlaron un foco de la enfermedad, actividad que podría generalizarse. Ésta es la primera investigación colombiana sobre la tungiasis, entidad conocida en Colombia desde que afectó a los soldados de Gonzalo Jiménez de Quesada, fundador de Santafé de Bogotá en 1538. 1. Heukelbach J, Oliveira Sa, Hesse H, Feldmeier H. Tungiasis: a neglected health problem of poor communities. Trop Med Internat Hlth. 2001;6:267-72. 2. Heukelbach J. Tungiasis. Rev Inst Med Trop S Paulo. 2005;47:307-13. 3. Núñez AR. Tungiasis. Gac Med Mex. 1952;82:11-5. 4. Heukelbach J, Costa AML, Wilcke T, Mencke N, Feldmeier H. The animal reservoir of Tunga penetrans in severely affected communities in north-east Brazil. Med Veter Entomol. 2004;18:329-35. 5. Witt L, Heukelbach J, Schwalfenberg S, Ribeiro RA, Harms G, Feldmeier H. Short report: infestation of Wistar rats with Tunga penetrans in different microenviroments. Am J Trop Med Hyg. 2007;76:666-8. 6. Pilger D, Schwalfenberg S, Heukelbach J, Witt L, Mehlhorn H, Mencke N, et al. Investigations on the biology, epidemiology, pathology and control of Tunga penetrans in Brazil: VII. The importance of animal reservoirs for human infestation. Parasitol Res. 2008;102:875-80. 8. Fernández de Piedrahita L.Historia General del Nuevo Reino de Granada; 1688. Fecha de consulta: 10 de enero de 2009. Disponible en: http://www.lablaa.org/blaavirtual/historia/hisgral/indice.htm. 9. Hoeppli R. Early references to the occurrence of Tunga penetrans in Tropical Africa. Acta Tropica. 1963;20:143-52. 10. Witt LH, Linardi PM, Meckes O, Schwalfenberg S, Ribeiro RA, Feldmeier H, et al. Blood-feeding of Tunga penetrans males. Med Veter Entomol. 2004;18:439-41. 11. Feldmeier H, Eisele M, van Marck E, Mehlhorn H, Ribeiro R, Heukelbach J. Investigations on the biology, epidemiology, pathology and control of Tunga penetrans in Brazil. IV. Clinical and histopathology. Parasitol Res. 2004;94:275-82. 12. Eisele M, Heukelbach J, Mehlhorn EVMH, Meckes O, Franck S, Feldmeier H. Investigations on the biology, epidemiology, pathology and control of Tunga penetrans in Brazil: I. Natural history of tungiasis in man. Parasitol Res. 2003;90:87-99. 13. Feldmeier H, Witt L, Schwalfenberg S, Linardi PM, Ribeiri RA, Capaz RAC, et al. Investigations on the biology, epidemiology, pathology and control of Tunga penetrans in Brazil. VI. Natural history of the infestation in laboratory-raised Wistar rats. Parasitol Res. 2007;102:1-13. 14. Trentini M, Pampiglione S, Marini M, Gianetto S. Observations about specimens of Tunga sp. extracted from goats of Ecuador. Parasitologia. 2001;42:65. 15. Pampiglione S, Trentini M, Fioravanti ML, Onore G, Rivasi F. Additional description of a new species of Tunga (Siphonaptera) from Ecuador. Parasite. 2003;10:9-15. 16. Pampiglione S, Trentini M, Fioravanti ML, Onore G, Rivasi F. Differential diagnosis between Tunga penetrans (L..,1758) and T. trimamillata Pampiglionie et al. 2002 (Insecta, Siphonaptera), the two species of the genus Tunga parasitic in man. Parasite. 2004;11:51-7. 17. Chadee DD. Tungiasis among five communities in south-western Trinidad, West Indies. Ann Trop Med Parasitol. 1998;92:107-13. 18. Heukelbach J, Mencke N, Feldmeier H. Editorial: Cutaneous larva migrans and tungiasis: the challenge to control zoonotic ectoparasitosis associated with poverty. Trop Med Internat Health. 2002;7:907-10. 19. Feldmeier H. Eisele M, Saboia-Moura RC, Heukelbach J. Severe tungiasis in underprivileged communities: case series from Brazil. Emerg Infect Dis. 2003;9:949-55. 20. Heukelbach J, van Haeff E, Rump B, Wilcke T, Moura RCS, Feldmeier H. Parasitic skin diseases: health care-seeking in a slum in north-east Brazil. Trop Med Internat Health. 2003;8:368-73. 21. Joseph JK, Bazile J, Mutter J, Shin S, Ruddle A, Ivers L, et al. Tungiasis in rural Haiti: a community-based response. Trans Roy Soc Trop Med Hyg. 2006;100:970-4. 22. Feldmeier H, Kehr JD, Heukelbach J, Poggensee G, Heukelbach J. High exposure to Tunga penetrans (Linnaeus, 1758) correlates with intensity of infestation. Mem Inst Oswaldo Cruz. 2006;101:65-9. 23. Muehlen M, Feldmeier H, Wilcke T, Winter B, Heukelbach J. Identifying risk factors for tungiasis and heavy infestation in a resource-poor community in northest Brazil. Trans R Soc Trop Med Hyg. 2006;100:371-80. 24. Ugbomoiko US, Ofoezie IE, Heukelbach J.Tungiasis: high prevalence load and morbidity in a rural community in Lagos State, Nigeria. Int J Dermatol. 2007;46:475-81. 25. Ugbomoiko US, Ariza L, Ofoezie IE, Heukelbach J.Risk factors for tungiasis in Nigeria: Identification of targets for effective intervention. PLoS Neglected Trop Dis. 2007;1:1-7. 26. Ariza L, Seidenschwang M, Buckendahl J, Gomide M, Feldmeier H, Heukelbach J. Tungíase: doenca negligenciada causando patología grave en uma favela de Fortaleza, Ceará. Rev Soc Brasil Med Trop. 2007;40:63-7. 27. Heukelbach J, Wilcke T, Harms G, Feldmeier H. Seasonal variation of tungiasis in an endemic community. Am J Trop Med Hyg. 2005;72:145-9. 28. Franck S, Feldmeier H, Heukelbach J. Tungiasis: more than an exotic nuisance. Travel Med Infect Dis. 2003;1:159-66. 29. Reiss F. Tungiasis in New York City. Arch Dermatol. 1966;93:404-7. 30. Zalar GL, Walther RR. Infestation by Tunga penetrans. Arch Dermatol. 1980;116:80-1. 31. Sanusi D, Brown EB, Shepard TG, Grafton WD. Tungiasis: Report of one case and review of the 14 reported cases in the United States. J Am Acad Dermatol. 1989;20:941-4. 32. Burke WA, Jones BE, Park KH, Finley JL. Imported tungiasis. Int J Dermatol. 1991;30:881-3. 33. Mashek H, Licznerski, Pinkus S. Tungiasis in New York. Int J Dermatol. 1997;36:276-8. 34. MA. Tungiasis in North America: A report of 2 cases in internationally adopted children. J Pediatr. 2001;139:744-6. 35. Brane S, Adams B, Bazemore A.Tungiasis in the returning traveler. J Am Acad Dermatol. 2005;52:1105-6. 36. Leung A, Woo T, Robson W, Trotter M. A tourist with tungiasis. Can Med Assoc J. 2007;177:343-4. 37. Grumwald M, Shai A, Mosovich B, Avinoach I. Tungiasis. Austral J Dermatol. 2000;41:46-7. 38. Swaminathan A, Gosbel Ib, Zwar NA, Douglas MW. Tungiasis in recently arrived African refugees. Med J Aust. 2005;183:51. 39. Veraldi S, Schiamnchi R, Cremonesi R. Bullous tungiasis. Int J Dermatol. 2005;44:1067-9. 40. Veraldi S, Valsecchi M. Imported tungiasis: a report of 19 cases and review of the literature. Int J Dermatol. 2007;46:1061-6. 41. Pospísilová A, Pirochtová K. Tungiasis (tungosis) comes to the Czech Republic. J Cosmet Dermatol. 2002;1:216. 42. Casals M, Campo A, García F, Aspiolea F, Camps A. Tungiasis. Presentación de dos nuevos casos y revisión de 20 casos de la literatura española. Actas Dermosifilogr. 1999;90:311-4. 43. Muehlen M, Heukelbach J, Wilcke T, Winter B, Mehlhorn H, Feldmeier H. Investigations on the biology, epidemiology, pathology and control of Tunga penetrans in Brazil. II. Prevalence, parasite load and topographic distribution of lesions in the population of a traditional fishing village. Parasitol Res. 2003;90:449-55. 44. Sachse MM, Guldbakke KK, Khachemoun A. Tunga penetrans: a stowaway from around the world. J Europ Acad Dermatol Venereol. 2006;21:121-16. 45. Connor DH.Tungiasis. In: Connor DH, Chandler FW, editors. Pathology of Tropical Infectious Diseases. Stanford, Conn.: Appleton and Lange; 1997. p. 1699-07. 46. Bezerra S.Tungiasis -an unusual case of severe infestation. Int J Dermatol. 1994;33:725. 47. Heukelbach J, Wilcke T, Eisele M, Feldmeier H.Ectopic localization of tungiasis. Am J Trop Med Hyg. 2002;67:214-6. 48. Heukelbach J, Sahebali S, van Marck E, Saboia-Moura RC, Feldmeier H. An unusual case of ectopic tungiasis with pseudoepitheliomatous hyperplasia. Braz J Infect Dis. 2004;8:465-8. 49. Heukelbach J, Bonow I, Witt LH, Feldmeier H, Fischer P.High infection rate of Wolbachia endobacteria in the sand flea Tunga penetrans from Brazil. Acta Trop. 2004;92:225-30. 50. Fischer P, Schmetz C, Bandi C, Bonow I, Mand S, Fischer K, et al. Tunga penetrans: molecular identification of Wolbachia endobacteria and their recognition by antibodies against proteins of endobacteria from filarial parasites. Exp Parasitol. 2002;102:201-11. 51. Kehr D, Heukelbach J, Mehlhorn H, Feldmeier H. Morbidity assessment in sand flea disease (tungiasis). Parasitol Res. 2007;100:413-21. 52. Feldmeier H, Heukelbach J, Eisele M, Sousa AQ, Meireles LB, Carvalho CBM. Bacterial superinfection in human tungiasis. Trop Med Internat Health. 2002;7:559-64. 53. Tonge BL. Tetanus from chigger flea sores. J Trop Pediatr. 1989;35:94. 54. Litvoc J, Leite RM, Katz G. Aspectos epidemiológicos do tétano no estado de Sao Paulo (Brasil). Rev Inst Med Trop Sao Paulo. 1991;33:477-84. 55. Beg MA, Mehraj V, Yakoob N, Pervez S, Salleem T, Zubart A, et al. Tungiasis: consequences of delayed presentation/diagnosis. Int J Infect Dis. 2008;12:218-9. 56. Smith MD, Procop GW.Typical histologic figures of Tunga penetrans in skin biopsies. Arch Pathol Lab Med. 2002;126:714-6. 57. Feldmeier H, Heukelbach J, Eisele M, Ribeiro R, Harms G, Mehlhorn H, et al. Investigations on the biology, pathology and control of Tunga penetrans in Brazil: III. Cytokine levels in peripheral blood of infected humans. Parasitol Res. 2003;91:298-303. 58. Feldmeier H, Witt L-H, Schwalfenberg S, Ribeiro R, Cunha F, Harms H, et al. Investigations on the biology, pathology and control of Tunga penetrans in Brazil: V. Cytokine concentrations in experimentally infected Wistar rats. Parasitol Res. 2004;94:371-6. 59. Bauer J, Forschner A, Garbe C, Röcken M. Dermoscopy of tungiasis. Arch Dermatol. 2004;140:761-3. 60. Bauer J, Forschner A, Garbe C, Röcken M. Variability of dermoscopic features of tungiasis. Arch Dermatol. 2005;141:643-4. 61. Bakos RM, Bakos L. "Whitish chains": a remarkable in vivo dermoscopic finding of tungiasis. Br J Dermatol. 2008;159:991-2. 62. Cabrera R, Daza F. Tungiasis: eggs seen with dermoscopy. Br J Dermatol. 2008;158:635-6. 63. Gibbs SS. The diagnosis and treatment of tungiasis. Br J Dermatol. 2008;159:981. 64. Marrero MD, Nagore E, Igual-Adell R, Rodríguez-Calabuig D, Castejón P. Tungiasis presenting with whitish nodules on the feet. J Europ Acad Dermatol Veneorol. 2003;17:247-8. 65. Heukelbach J. Revision of tungiasis: treatment options and prevention. Exper Rev Anti Infect Ther. 2006;4:151-7. 66. Geary TG. Ivermectin 20 years on: maturation of a wonder drug. Trends Parasitol. 2005;21:530-2. 67. Heukelbach J, Franck S, Feldmeier H. Therapy of tungiasis: a double-blind randomized controlled trial with oral Ivermectin. Mem Inst Oswaldo Cruz. 2004;99:873-6. 68. Heukelbach J, Eisele M, Jackson A, Feldmeier H.Topical treatment of tungiasis: a randomized, controlled trial. Ann Trop Med Parasitol. 2003;97:743-9. 69. Schwalfenberg S, Witt LH, Kehr JD, Feldmeier H.Prevention of tungiasis using biological repellent: a small case series. Ann Trop Med Parasitol. 2004;98:89-94. 70. Feldmeier H, Kehr JD, Heukelbach J. A plant-based repellent protects against Tunga penetrans infestation and sand flea disease. Acta Tropica. 2006;99:126-36. 71. H, Mencke N. Field trial of the efficacy of a combination of imidacloprid and permethrin against Tunga penetrans (sand flea, jigger flea) in dogs in Brazil. Parasitol Res. 2005;97:S113-20. 72. Rodríguez G. Hematoquecia letal por angiostrongilosis abdominal. Biomédica. 2000;20:120-30. 73. Ariza Y, Rodríguez G. Haga usted el diagnóstico. Biomédica. 2001;21:162-6. 74. Rodríguez G, Tamayo M, Boshell J. Estructura del quiste hidatídico producido por Echinococcus oligarthrus en el hospedero intermediario Proechimyis c.f. guairae (rata espinosa) en Casanare, Colombia. Biomédica. 2000; 20:238-47. 75. Rodríguez-Toro G, Téllez N. Lobomycosis in Colombian Amer Indian patients. Mycopathologia. 1992;120:5-9. 76. Rodríguez G. Pénfigo foliáceo en indígenas colombianos. Rev Soc Col Dermatol. 1993;2:91-4. 77. Salved-Sánchez B. Claves para la identificación de adultos de las especies de pulgas (Insecta: Siphonaptera) comunes y de mayor importancia médica en México. Folia Entomol Mex. 2004;43:27-41. 78. Oliver LM, Pérez R, García L. Epidemiología de la Tunga penetrans en Venezuela. Dermatol Venez. 1997;35:99-105. 79. González A, de Villalobos C, Ranalletta MA, Coscaron MC. Aspectos adaptativos y biológicos de Tunga penetrans (Linné 1758). Epidemiología en comunidades aborígenes del norte argentino. Arch Argent Dermatol. 2004;54:119-23. 80. 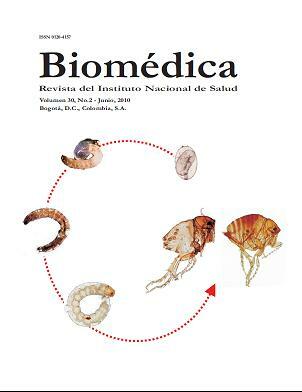 Bonilla-Naar A. Historia de la medicina tropical, parasitología e higiene en Colombia. Bogotá: Cooperativa Nacional de Artes Gráficas; 1950. 81. Instituto Nacional de Salud. Bibliografía, INS, 1930-1992.Bogotá: Instituto Nacional de Salud; 1996. 82. López MC, Corredor A, Nicholls S, Agudelo CA, Álvarez C, Cáceres E, et al. Atlas de parasitología. Bogotá: Manual Moderno; 2006. 83. Botero D, Restrepo M. Parasitosis humanas. Segunda edición. Medellín: CIB; 1995. 84. Herrera SE, Ochoa A, Escovar M, Correa LA. Tungiasis -reporte de un caso. Rev Asoc Col Dermatol. 2004;12:63-6.